This is a post I have been postponing for a while,just because I wasn't satisfied with my pictures. This is my friend,Bindu's recipe. I told her ,when I made this for the first time,that I will post it in a week or so.Since she is one of the nicest persons I know, she never asked why I didn't post.Even now, I am not quite happy with the pictures, I thought I will post this, as this is the zillion-th time I made this and it is high time that I must tell my friend how much my little family loves it and I would recommend this to anyone I know. If you are following me for a while,or if you know me, you know that I started to learn cooking mainly for surviving,or rather to find a way to my man's heart ! But I have had so many friends and a younger sister who were experts well before that.Bindu,my classmate,hostel mate,room mate and a good friend is one of those who used to awe us all by the great food she used to prepare and bring while we were in a hostel,where great food was, far more than a dream. There were 2 kinds of people who used to stay in that hostel.The lucky ones,like Bindu, who used to go home frequently,mostly because they are from Malabar area (North Kerala) which is closer to Mangalore where we went to college. And the unlucky ones like me or Sunitha ,who are from Travancore area(South Kerala),who used to go home only during long vacations. Bindu's mom is also a great cook and I am sure she inherited the "kaipunyam",from her mother. Bindu used to bring us so many home made stuff like "kallummekkaya achar"(Pickled Mussels) and also,the world famous Calicut Halwa,on her way back to hostel.Poor girl, we used to force her to leave behind her laundry or whatever stuff she wants to take home,so that she has enough space left in her bag for all the goodies in the list we give her ! Thanks so much mate,for doing that for us ! Now Bindu is also in US and we talk quite often, most of our conversations ending up with food. Once when I called her,she was making this delicious pudding for her guests and on my request she shared the recipe for me.On my next trip to Asian market I got a tender coconut, which was the only ingredient I didn't have at home and made this .I made this simple and easy-to-make dessert, over and over and I would recommend that you all try this ASAP ! 1.Break open the tender coconut,preserve the water and take out the pulp with the help of a spoon.Using your hands break big pieces into small.If coconut is hard to handle with hands,use a knife to make small pieces. 2.Take 5 Tbsp of water in a bowl and sprinkle gelatin over and let bloom. 3.Heat condensed milk and milk together in a pan until it is scalded. 4.Mix in bloomed gelatin in this hot milk mixture and mix until gelatin is completely dissolved. 5.Let mixture come to room temperature and add coconut pulp and coconut water,mix well. 6.Pour into pudding bowls or a big serving bowl and cover with plastic wrap. Keep in refrigerator and set for at least 3-4 hours. 7.Serve with cashews/pistachios chopped coarsely or caramelized sugar or as it is. 1.If you like your desserts really sweet,add 1 or 2 tbsp of sugar while you heat milk. 2.You can use china grass(agar agar) instead of gelatin and make it pure vegetarian.If you are using agar agar powder, use the same amount as gelatin (2Tbsp), but if you are using agar agar flakes, use about 4Tbsp. The picture is awesome, I think! Staying in the land of tender coconuts..this wonderful pudding needs a try soon! Awesome recipe with tender coconut and Namitha, the pictures are gorgeous. You are too humble! Gorgeous pudding, worth the wait pics nami. Hats off to your friend bindu for the recipe. the weather here is such that all we crave now is light flavourful food and am drooling at these clicks. such a smooth looking divine pudding. you are not satisfied with this photo!?!?!?!?! Delicious coconut pudding, tempting one. who says the snap is not good .. it is super awesome.. enough to make anyone want the pudding :) Love it totally ! The pictures not that bad Namitha..But sometimes,we won't be satisfied..Isn't it ? I basically can't get tender coconuts here.Otherwise I would have tried on pudding even before..Such a divine dessert..Looks superb Namitha. Hey Nami thanks a ton for all that praise.. ! 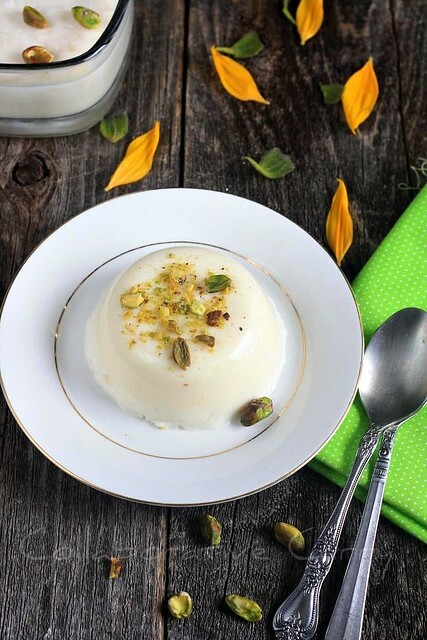 !the pics look good..
Namitha, this is like a non-dairy panna cotta! Ms M is crazy about tender coconuts and panna cotta. I think a trip to POM is in order! Thank you! Oops! Not so non-dairy! I read coconut milk instead of condensed milk. But now that I have that idea in my head . . .
Had this awesome pudding when I was in Kerala, but didn't try it myself. I wanted to try it from so long but didn't find the tender coconut in stores. Clicks are just fab Namitha n pudding definitely sounds awesome.. Delicious pudding and the pictures are so lovely. I might have hard time finding tender coconut though but will definitely keep this recipe in mind the next time I come across tender coconut. Lovely write up and yummy pudding. This sounds so very wonderful! 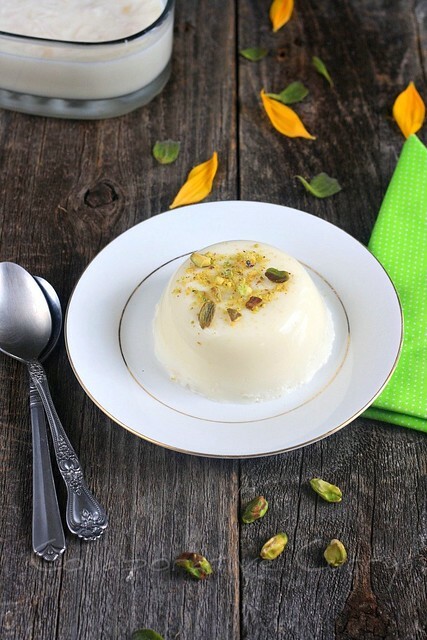 I make pannacotta with coconut milk, but never ever thought of using the beautiful pulp and the water. now where to find the fresh pulp.. not here i know :( Namitha the photographs are really beautiful. Pudding looks divine,had this one but never tried making at home..will surely try this now..looks irresistible. Beautiful Clicks Namitha...Will try this coconut pudding soon. Bookmarked. I am always in awe with all the stuff we can create with coconut. The flavor is just so exquisite i must say. Really delicious! 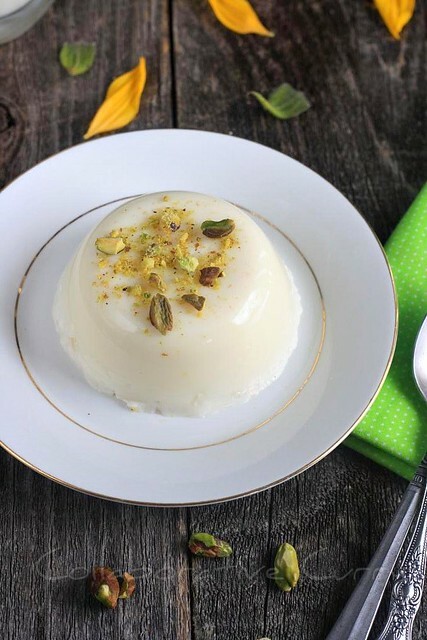 i love all flavour pudding...but this very interesting and delicious...nami i want to taste it now pls pass me...nice click! Hello Nami! How you been dear? Been a long time since I made my way here. njan ithu kazhichittundu chechi..from amma's friends house..Adipoli ayittundu kto..! enikku payasam and ithu( pinne white bread) njan veettil varuvanenkil venam kto.. Awesome da! Looks great the pictures are pretty good.. good going. I miss blogging whenever I see your great posts :) love! Wow..i luv this so much...glad to read ur hostel days..I too had similar life in hostel. Nami this looks so so good. I too tried a similar version recently and loved it. Click are lovely!!!!!! Are you speaking about Bindu who had joined for BBM at Agnes and left as she got admission for engineering? If it is her pls do give me her mail ID. Would love to get in touch. Wow..this is going to be the dessert for the weekend.Thanks for sharing and what a lovely blog you have! seems like coconut panna cotta without the cream though. Sounds and seems delicious. I think the pictures are swell! I totally believe in "kaipunyam". Thanks for sharing your lovely hostel memories. A refined dessert! So luscious looking and sounding. Tried this recipe a few days back, it turned out sooooo well! The recipe is is easy to follow! Will make a great dessert recipe for dinner parties! Thanks a bunch! I used silicon cupcake moulds, and they were so cute! Hi Namitha, could you please tell me what is your cup measurement? 2 cups milk equals to how many ml?